Looney Tunes Galactic Sports is one of the few Vita exclusives being published by Sony this year, and comes to us in the shape of a family friendly set of space-themed minigames. We took the game for an intergalactic spin, and here are our thoughts. For better or for worse, the latest Looney Tunes game reminds me of the many sports games that ended up coming out for the original Wii after the success of Nintendo’s own Wii Sports. Quite often, these games would turn out as rather generic collections of minigames – and in most cases, as long as the controls worked, the were fun enough to play. None of them ever innovated upon the core concept though, and that’s true for Looney Tunes Galactic Sports as well. Which doesn’t make it a bad game – just not the most remarkable one out there. On the bright side: the Vita doesn’t have a huge collection of minigame-themed games yet, so it’s a welcome addition. 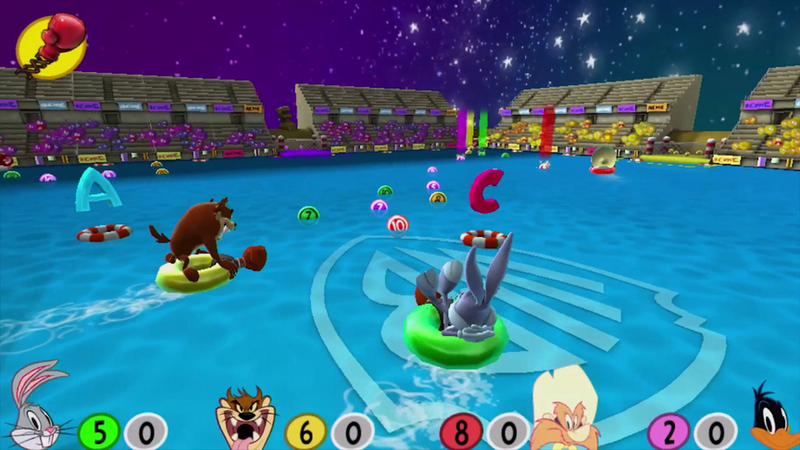 The game features six different games/sports to compete it, and they all share outer space as a theme. The events take place on and around Mars, are hosted by Marvin the Martian, and (to drive the point home even more) feature names such as Galactic Archery, Space Races and Space Boxing. This being a Looney Tunes game, none of these events are to be taken all too seriously and perhaps ‘Galactic Games’ would have been a more appropriate title. Fun and silliness is more important than trying to recreate a real sport, and it helps that the game features a ton of familiar characters. Aside from the usual suspects Bugs and Daffy, you’ll also encounter Taz, Wile E. Coyote and Yosemite Sam as well as other characters you can unlock by playing. The individual mingames are a mixed bag, as is so often the case with compilation like this. Archery uses the Vita gyro controls, which is fun to play around with – whereas the controls during the golfing levels seem easy enough but are impossible to master. Boxing and racing are fun enough in their own right, even though they are rather simplistic in nature. There’s an added layer of Looney Tunes-themed fun in the various power-ups you encounter, but this is mostly some ACME-flavored frosting that does little to add depth to the gameplay. This makes Looney Tunes Galactic Sports a game that is best geared towards children. The minigames are accessible, the graphics are bright and colorful and there’s a healthy dose of silly fun throughout the entire experience. As a sports game it falls short of the mark, and I wish they had done more with the Looney Tunes license, but that doesn’t mean it’s a game without merit. It’s family-friendly and supports multiplayer, so consider this if you have little ones to play with. Because if one this is true for pretty much all of the minigame-themed games out there, it’s that they’re more fun when played together.